This Block Report interview, recorded this morning, April 1, at about 8 a.m., is Keith Cook giving an update on his brother, the world renowned journalist and political prisoner Mumia Abu Jamal. This interview by the Block Report with Professor Johanna Fernández was recorded this morning, March 31, at about 8 a.m. PDT. Stay updated by visiting Bring Mumia Home and Johanna Fernández’ Facebook page. Update as of Tuesday evening: From Mumia’s attorney Bret Grote of the Abolitionist Law Center: “Yesterday morning, March 30, Mumia Abu-Jamal was rushed to the hospital after passing out at State Correctional Institution (SCI) Mahanoy. He was admitted to the Schuylkill Medical Center with a blood sugar level of 779. Today, he received visits from his wife, Wadiya, and his brother, Keith Cook. Mumia’s blood sugar had dropped to 333 as of a couple hours ago. This is still elevated and at an unhealthy level. “Mumia does not have a history of diabetes but had been experiencing a series of symptoms that should have alerted medical staff at the prison to the onset of the disease. Instead, he was not given comprehensive diagnostic treatment and a medical crisis emerged that could have resulted in his slipping into a diabetic coma or worse. “Prison officials only relented and permitted visitation under immense public pressure from all over the world. Keep it up. If the prison had its way, nobody would know Mumia was hospitalized, nor would they have permitted visits or the release of any medical information to his family. “Family and friends are not leaving Pottsville. Mumia is not out of danger and we will remain vigilant and mobilized. The state keeps trying to kill Mumia – spied on by the FBI since he was 15, shot in the chest and severely beaten on Dec. 9, 1981, framed for a killing he did not commit and put on death row, held in solitary confinement under threat of execution for 30 years, and now denied competent, basic medical care. “He is alive because the movement has fought like hell to make it so. The government of the united states of apartheid can never be trusted to protect the rights or respect the lives of Black people or those held in prison. Never forgive, never forget. Stay alert and ready to act. Most importantly, he adds, “The immediate demand now is for his case to be reviewed by doctors representing his family.” Please call the numbers below, which have been corrected and updated. 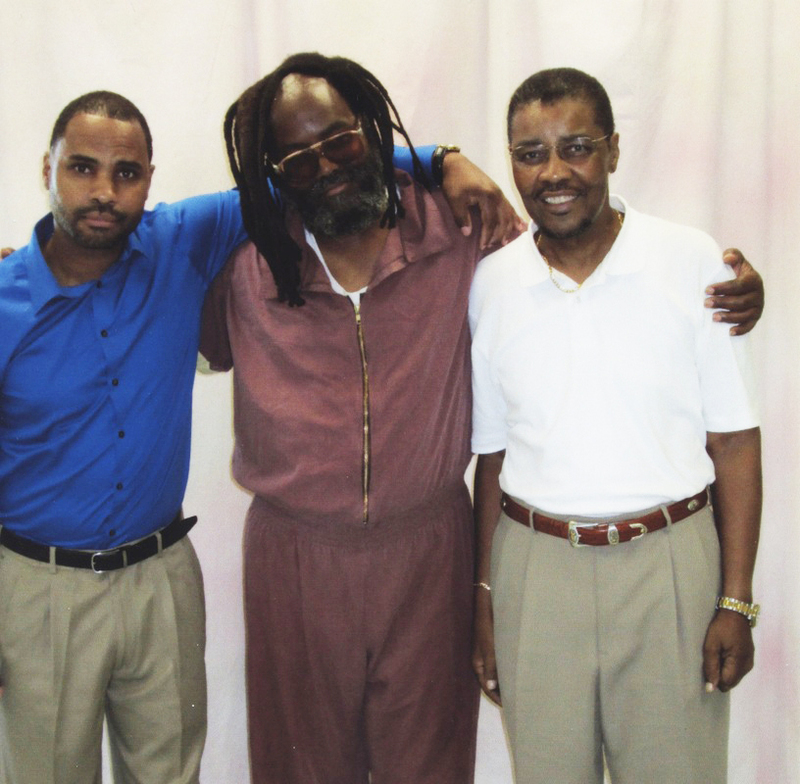 In a picture taken last year, Mumia stands between his son, Jamal Hart, and his older brother, Keith Cook. Abu-Jamal’s longtime friend, Professor Johanna Fernández of the Bring Mumia Home campaign, said she only learned he had been transferred when she went to visit him Monday morning at SCI Mahanoy after worrying that he had sounded sick when the two spoke by phone last week. Abu-Jamal’s brother and next of kin, Keith Cook has traveled from North Carolina to Pottsville, but so far has been denied access. Prison authorities say they refuse to comment on inmate medical conditions or hospitalizations, and a hospital official said he had no information about Abu-Jamal. Abu-Jamal was convicted in 1982 of killing of a Philadelphia police officer, but has long maintained his innocence and is one of the world’s most famous political prisoners. Supporters say hospital staff has confirmed Abu-Jamal is in the ICU. They think he is being held in a private room that has the curtains drawn and is under armed guard. No updates have been given on his condition. They remain extremely concerned and are asking for people to call authorities and request that his family be allowed to see him. Democracy Now! is broadcast weekdays on over 1,300 radio and TV stations, the largest public media collaboration in the country, and at www.democracynow.org, where archived shows, transcripts, podcasts and more can also be found. At 1 p.m. EST on Monday, March 30, Mumia Abu-Jamal had a medical emergency and was taken to the Intensive Care Unit at Schuylkill Medical Center in Pottsville, Penn. SCI Mahanoy prison officials are blocking all family visits at Schuylkill. Mumia’s family is currently waiting at Schuylkill. We have absolutely no trust in prison officials to provide transparency on Mumia’s current condition to his family. Just weeks ago, prison officials said Phil Africa was fine, and three days later he passed away. Prison Radio, headed by Noelle Hanrahan, has from the beginning recorded Mumia Abu-Jamal’s commentaries, which are now broadcast around the world; produced and distributes the documentary, “Long Distance Revolutionary: A Journey with Mumia Abu-Jamal”; and is a leader in the court battle to overturn the so-called Mumia Gag Law intended to silence Mumia. Visit http://www.prisonradio.org/ and contact Prison Radio at info@prisonradio.org. This entry was posted on Monday, April 6th, 2015 at 2:10 pm	and is filed under Other Articles. You can follow any responses to this entry through the RSS 2.0 feed. Responses are currently closed, but you can trackback from your own site.